A dental bridge is an appliance used to replace one or more missing teeth. As the name implies a bridge “bridges” a gap. Most bridges are made of a “pontic tooth” (false tooth that can be made of gold, alloys, porcelain, or a combination of these materials) and held together by two crowns (a “cap” that covers the tooth, nearly identical to its normal size and shape). This appliance cannot be removed by the patient as they are cemented into the abutment teeth (the existing teeth that sit on each side of the gap). Traditional Fixed Bridges – Described above. This is the most popular type of dental bridge available. It is called a “fixed bridge” because it is a permanent improvement. 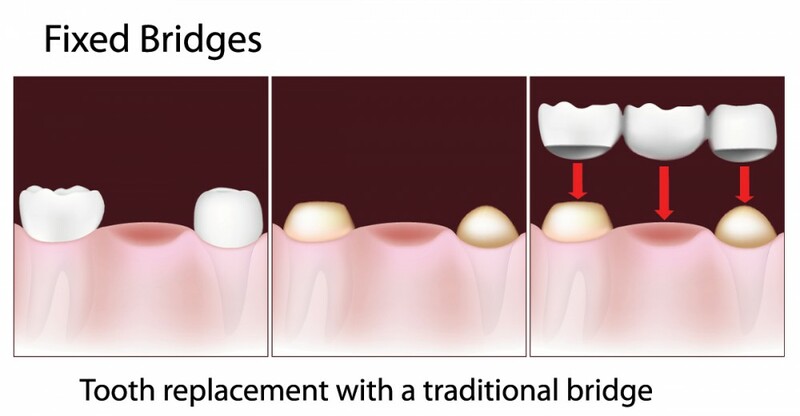 Resin Bonded Bridges involve pontic teeth being fused together to metal bands, and then bonded to the back of the abutment teeth with a resin cement. Resin bonded bridges are typically used when teeth are missing directly in the front of the mouth. Cantilever Bridges may be used when certain areas of the mouth are under less stress, such as the front teeth. Cantilever bridges are used only when teeth reside on one side of the open space, which entails anchoring the false tooth to one side over one or more natural and adjacent teeth. What Benefits do Dental Bridges Offer? Dental bridges offer several benefits. When placed by a qualified dentist, such as Moreno Valley cosmetic and general dentist Dr. Naik, they can: enhance your smile, provide you with the capability to properly chew and speak, maintain and/or reshape your face into a more aesthetically pleasing appearance, allocate the forces in your bite for greater strength and stability, and prevent any potential malpositioning of the remaining teeth. The abutment teeth are prepared during the first visit. This preparation involves recontouring these teeth, which is done by removing a portion of enamel to allow room for a crown to be placed over them. Impressions of your teeth are made next; they serve as a model from which the bridge, pontic, and crowns will be made by a dental laboratory. Dr. Naik will make a temporary bridge for you to wear, so that the exposed teeth and gums are protected until the actual appliance is ready to be placed. The remaining portion of the process takes place during the second visit. At this time, your temporary bridge will be removed and the new permanent bridge will be checked and adjusted, as necessary, to achieve a proper fit. Depending on your individual case, you may be required to visit the office of Dr. Naik on multiple occasions in order to have the fit of the metal framework and bite checked. He may even cement it in place for a couple of weeks to make sure it is fitting properly, if the dental bridge is a fixed bridge. The bridge will then be permanently cemented into place after a few weeks after the fit appears correct. Do Dental Bridges Last Forever? It would not be unordinary for the life span of a fixed bridge to last for more than 10 years – dental bridges may last anywhere from five to 15 years. A patient can help to further the lifespan of the dental bridge if he or she is committed to good oral hygiene and regular prophylaxis (prevention of or protective treatment for disease). What Type of Care do They Require? In order to maintain the success of the bridge, you must keep your remaining teeth healthy and strong. This is because the success of the bridge, depending on the type of bridge chosen, is contingent on the solid foundation of the surrounding teeth. You can help to prevent tooth decay and gum disease (which can lead to tooth loss) by making it a point to brush twice a day and floss daily. It is also important to keep a regular cleaning schedule with Moreno Valley Dentist, Dr. Naik, as this will help to catch and diagnose any problems early on. Please note that it is also important to maintain a balanced diet and health regimen that includes proper nutrition.